- Great educational historical toy for kids and adults. 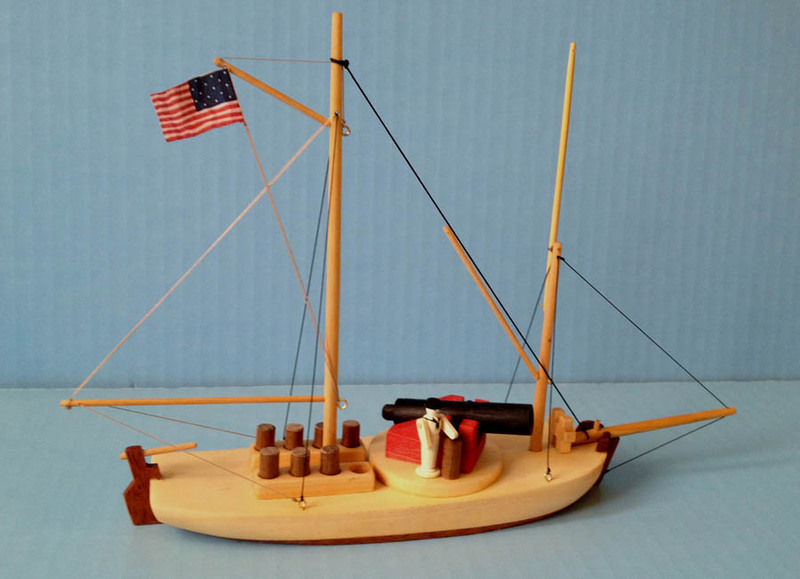 - Based on real gunboat design developed by Commodore Edward Preble in 1804 during his command of US Mediterranean Squadron in war with Tripoli. - Quality hardwoods for hull and parts: poplar, mahogany, maple, birch, walnut. - All wooden parts are carefully sanded smooth and corners are rounded. - Sailor is 1"(25 mm) high with movable arms. Made from strong and beautiful American holly wood, - whitest wood in the World. Additional sailors can be purchased separately. - Cannon rotates 360 degrees and fires wooden pegs for up to 12 feet. - 15 stars flag can be lowered and raised. US President Thomas Jefferson (1801-1809) believed that a suitable naval force would consist of small gunboats that could defend the home waters of the United States. To create this defensive force, Jefferson ordered cutbacks in major ships and the construction of a fleet of small gunboats. He had seen proof of the effectiveness of gunboats in the defense of Tripoli. These small ships were typically about fifty-sixty feet long and eighteen feet wide, with a shallow draft for use in the shoal waters of America's harbors. They were variously rigged, with oars, sails, and a crew of about twenty. If the wind failed or if they were engaged in close combat, they could be propelled by oars. Each carried two to three guns: 18- to 24-pound swivel-mounted guns or 32-pounders on traversing carriages. Each gun could weigh as much as seven thousand pounds, which meant that a shallow-drafted gunboat would not fare well in heavy seas. By February 1805, fifteen gunboats had been built. These small vessels were favored by the Republicans, who saw a $302,000 ship like the Constitution as an unnecessary drain on the nation. First estimates put a gunboat's cost at $5,000; in actuality, costs totaled over $10,000. Nevertheless, Congress authorized 25 in 1805, 50 in 1806, and 188 in 1807. They were to be built at various ports around the nation. Jefferson and other Republicans knew that gunboats posed no threat to the British navy and thus would not provoke a preemptive strike. Gunboats could be distributed to many American ports and provide defense to a larger territory for less money than a frigate navy. Jefferson envisioned gunboats used in conjunction with land batteries, movable fortifications, and floating batteries to repulse attacks. In time of peace gunboats could be laid up in sheds, which would cut down on maintenance and personnel. But there were weaknesses in the Republican plan. A passive defense was useless against an invader with a strong navy like Britain. One frigate had the gun power of forty gunboats, and with their thin planking and low decks exposed to gunfire, gunboats stood little chance of survival. Invasion points were never known, and the few gunboats stationed at various American ports could provide only minimal defense. Furthermore, a gunboat was useless at sea and thus could not defend U.S. commerce. Jefferson's theory of naval defense would lead to the loss of much of the naval strength the United States had gained since the Barbary War of 1805, leaving the nation with an inadequate naval force when it needed it most. Following the inauguration of James Madison in March 1809, the United States began to move away from its gunboat policy. One hundred gunboats already authorized for construction were never built. Most of the existing boats were put "in ordinary," and by December 1811 only sixty-three gunboats remained in service. By the spring of 1812, war was imminent. War hawks in Congress finally forced Madison's hand, and war was declared on June 15, 1812. The U.S. Navy had seven frigates, four schooners, four ketches, and 170 gunboats to pit against the greatest naval power the world had ever seen.